It is the end of the first quarter of 2016 and without a doubt we are facing turbulent times here in South Africa, other parts of Africa and the world in general and most of us are looking for quick yet effective ways to bust our sales targets regardless of the economic and political conditions locally and internationally. At times like this each and every one of us have to take control of our own economies to maximise our sales and business results. On April 14th and 15th I will be conducting a 2 day “Bust Your Sales Targets In Turbulent Times” seminar / workshop in Johannesburg, South Africa to help ensure that you bust those monthly sales targets. Note: If you want to learn more about the 2 Day seminar / workshop immediately and read The Big 8 ideas later just go to the bottom of the article where you will first find the details on the Bust Your Sales Targets In Turbulent Times seminar / workshop. Set a target for yourself and your people that each week by Thursday at 4pm everybody has 70% of their appointments for the following week (of their self-controlled proactive time) already booked and 30% for the next week. This helps with a fast start for the week, which gets the momentum going early in the week. Put in an Incentive each week for everyone in reference to reaching this appointment target. Add to this idea two early morning appointments each week and one late afternoon appointment. Starting earlier and ending later will increase sales. It increases the activity of being in front of clients more often. In turbulent or challenging times we need to increase our activities. On one survey only 12% of the sales force would take three “No’s” from a client and keep on calling. That 12% wrote over 80% of the sales in the group surveyed. Don’t give up too early. Be sure to add value on each contact…it is not about frequency to the level of annoyance without value add. When setting appointments have your people sit down and phone clients in batches. That way you and your sales people gain momentum and energy with each call. Momentum and energy draws people to you and puts you in the maximum performance area where your mind is sharp and in the flow. Often it is necessary, although phoning in between doing other things doesn’t build momentum and it can often be disruptive to the flow. The key is to “get in the zone” and stay there. The fact that most clients are running at capacity it seems to be getting more difficult to make contact with some clients by phone to set an appointment. Some of my clients are having great success sending meeting requests with a brief “captivating” reason for the meeting. Meeting requests are becoming a way of life. They’ve been pleasantly surprised by the number of positive responses they are receiving. This is outside of the box thinking. Many of my associates within the speaking and training industry ask me how I write million rand deals. I always ask how many million rand proposals do you have in the pipeline. They often say none. My answer… you will only write million rand deals if you have million rand proposals in the pipeline with a million rand value to the client. What I am saying is go fishing where the fish are. Here is an exercise I did with my team that gave us more than 300% increase the following year. We asked ourselves this question: “Which companies, organizations, institutions or government departments could invest R20 million or more, R15-20 million, R10-15 million, R5-10 million, R2-5 million, R1-2 million in a given year if we gave them a good enough reason to do it. Then we filled in the names of the companies and organizations in the appropriate category and came up with ideas on what they may need and proceeded to calling on these clients with a specific tailored strategy in mind with frequency of contact over a given period of time. Sales really jumped that year and we landed several of these clients. Focus on the right prospects and clients with the right frequency with the right database (frequency of contact) selling tools and methods with the right solutions. Categorize your clients/prospects AAA, AA, A, B and C. The D’s (Disengage) you don’t need. Put a special emphasis on your Develop clients. We categorize present clients under Retain and Develop and the prospects under Regain and Gain. In the Develop column you find the gold that is near the surface. A Develop client is someone who you are receiving a small amount of business from who has the potential of spending much more with you. A competitor may be their supplier of preference. Put a frequency of contact strategy together, along with value-add ideas, and conduct a proper needs analysis. You already have a relationship of one degree or another with the client. Accelerate your effort and build the relationship. Sooner or later in most situations the competitor will drop the ball and you are sitting in an excellent position to bring the majority of the business to you. If you are alive you are in sales. In other words, we are all in the business of influencing others. If we are not directly in sales then we are in the business of supporting others in our company that are in sales and their clients. No sales, no jobs, no companies. Get everyone involved in sales. In small to medium sized businesses the business owner is often the best salesperson. Also senior executives in corporates are often the best salespeople as well. Don’t forget this. Clients and potential clients like to hear from the top person. Put together your own list of clients and get in front of the right clients more often. That could give you a big increase. Also have your service and support people involved. Have them make telephone calls in reference to client satisfaction and how and when your company can be of more help. Even your credit department needs to look for opportunities for additional sales. Give all your members (support people etc.) personalized business cards with their name printed on it and teach them how to prospect with the business cards. When one of my sons was 12 years old he gave his business card to an executive on a chairlift while going up a ski mountain. The president of the company called me personally to hire me. He was very impressed that Shane had a business card, a title and was part of the business. I’ve had some technicians in automobile dealerships bring in more clients than some of the salespeople because they were given personalized business cards and shown how to use them. The business cards will also give a sense of ownership and motivation to staff who have never had a business card. By the way both Nedbank Swaziland and MTN Swaziland took my suggestion and did this and it helped improve the results on their happiness survey with staff and management. (Group Cultural Audit). Keep in mind that there is a difference between sales targets and revenue targets. I’ve had clients that hit their sales targets but missed their revenue targets because the revenue from the sale may come in over a 3-36 month period. In the early part of a 12 month period put a special emphasis on a “fast start” and try to have 70% of your annual sales target sold at the halfway mark. That helps with the revenue. Put in short term incentives for over-achieving in the early months. This also can be done in a given month. How about incentives that help salespeople hit monthly targets early? Try WIN IN TEN – by the 10th of the month 45% of monthly target is reached. What about PLENTY AT TWENTY – 90% of monthly sales target achieved by the 20th of the month. Also, be sure to measure. What gets measured gets managed and what gets managed gets done. Put a “peg in the ground”. The difference between a goal and a dream is – a goal is a dream with a deadline. The dream could have been “new stadiums in Soweto, Cape Town, Durban and Port Elizabeth here in South Africa. Chances are it would not have happened. It probably would have been “someday we will do it.” We won the bid for the 2010 Football World Cup. The deadline for the stadiums was June 11, 2010. They all got built on time. It became a dream with a deadline…which is a goal. Be innovative…think outside of the box and remember planning and ideas are great, but it’s action that creates clarity. Take your pick from the “Big 8” and start moving towards busting those sales targets in turbulent times. I trust these busting sales targets gems have been of value to you. Thank you for investing your valuable time with me. I look forward to meeting you personally. Each participant will receive Bill Gibson’s Boosting Sales & Profits With Focus Selling Program on a USB Memory Stick which includes 12 Audio Tracks and a 345 Page Learning & Implementation Guide valued at R4, 000. Bill also will include on that USB Memory Stick, a 90 Page Objection Handling Guide with 103 Common Objections we get in selling and examples on how to handle them valued at R1, 800. Total Value in Bonus Products R5, 800…FREE! Arrive back with a minimum of 20 excellent contacts for future business, future referrals, possible new team members etc. As an individual or as a team member, each member will write down the three most important learnings that they will implement when they arrive back from the event. Make it a team “upliftment” event. Take your entire team or take a client or potential client or even family members and friends with you (pick up extra tickets and take a client) and grow the relationship or meet them there if you know they are attending. Have dinner after the event with a client or important contact who is attending the event. Consider using the event for some specific prospect / client research that could lead to an appointment. Two or three questions will do. It is a mini needs analysis. Lots of business cards, brochures, memory sticks etc. with you…set a target for giving away. If you are a student or are unemployed have personal business cards made up and carry them with you. Good size book for making notes when listening to the presentation. Small pocket size / purse size “lead book” for writing down contact details. Have symbols that tell you how urgent it is. E.g. : A “star” for important / immediate, “happy face” for later follow-up and a “heart” if you are in love again. LOL. Have branded promotional items to selectively give away. Brainstorm the questions, requests and objections people may pose once you introduce yourself. Be prepared with good clear answers. Have your “smartphone” or “camera” with you to take photos that you can send to people later and post on social media…with their permission. Have a quick training session as a team to go over how to best maximize our return on investment at the event. Review the start and end times of the event. Be there 1 hour before the start of the event to maximize your networking opportunity. Have a map of where the venue is and count on heavy traffic. Leave early. Have credit cards or cash with you for buying refreshments etc. (At some events you could purchase a Diamond ticket and let the organizers pay for your refreshments)…if this type of ticket is available. Also in advance be sure to have your credit card or debit card or lots of cash with you so that you can take advantage of the special offers made by some of the speakers. This can help support you so that the information and the impact of the speakers can last for a lifetime. Put together a “special introductory offer” in reference to your services or products if appropriate. As a team, agree or decide on a dress code. Remember it is easier to dress down than dress up. E.g. It is easier to take off a necktie or jacket than find a necktie and jacket at an event. “In many situations we do not get a second chance to make a first impression.” Also…“We cannot judge a book by its cover although an attractive cover does earn the book a second look.” Look your best! Remember, if you are engaging with someone and discuss your products or services remember to introduce advantages and benefits not just features. At the event listen more than you talk. Ask meaningful open questions and do not over step boundaries with new contacts. Respect them. Being in the front row sitting in a lounge chair. That way you are comfortable during the entire session and there will be minimal distractions. In addition you are close to the guest speakers and it becomes more personal. It helps anchor you for future recall of how you felt and what you heard. If there is such a special ticket like a Diamond ticket you would also be the first in the room along with other influential individuals. Take the special exclusive package, if you can, that gives you private registration and allows you to network with an exclusive group of attendees in a private room before the event and during breaks. Attend the luncheon with the speakers if there is such a package. Prepare a good question in advance for the speakers and get a photo with the speakers. Include that photo in your marketing materials, your “brag book”, on social media sites and display it in your office. It shows others including clients that you invest in personal and business development. The photo can also be an “ice breaker” and “open up” a conversation. Avoid the line-ups where attendees have to buy their refreshments. With a special ticket if offered, you can often be part of the exclusive group that has the organizers supply these extras including things like a manual, pen, free goodie bag plus a CD of the event for sustainability purpose. Note: It may sound like I am encouraging you to enrol and purchase an exclusive type ticket offer like a “Diamond” Package. That is what I am doing. For the extra investment it could “Really Pay” you 10 times over. Saying that…a General Ticket or even a FREE Ticket at the back and no frills is still a good decision. I am only suggesting that you treat yourself as special to get your best ROI of your time, energy, ability, money and reputation (brand) if possible and if it is offered. The scope of networking is incredible. To give you an idea, consider the study that was done in the 1970s in which people in the United States were asked to try to get envelopes delivered to particular people in Africa. They had to pass the envelopes on to people they knew personally, who could pass it on to people they knew, and so on until it got to someone who actually knew the person in Africa and could deliver it there. The study tracked how many times each envelope changed hands before it got from a randomly chosen American to a randomly chosen African through people who knew each other. On the average, the envelope changed hands five times. Apparently, a similar study was done with envelopes going from West Coast of the United States to the East Coast. They got there faster than they did through the post office. (That was when post offices were effective). That’s the power of networking. Imagine that the company you work for stopped all advertising, took down their online marketing, took the sign off the front of the building, took its name out of the Yellow Pages and all online directories and removed all the “normal” ways to build customer traffic. What could you and management do to generate new business? What if the company were in a really tight financial spot and did not have the money and leverage to join associations or run advertising or buy into a directory or even rent a list of contacts? Besides sales calls you and the rest of the key people in the company would need to start networking. Management would sit down with the staff and see what kind of options everybody had for finding leads and referrals. Networking is not only a great way of generating leads, but is a great way to reach someone faster than through the normal channels. We also grow and learn by networking with the right people…that’s why I recommend a Diamond Package at an event if it is possible. In countries throughout the world there are tens of thousands of meetings being held daily. During these meetings, salespeople and other business people have a tremendous opportunity to gain new contacts, new business, retain business and develop their own professionalism. What is networking? Networking is the name for the process that often bypasses the hierarchy of organizations and shortens the rapport and trust building process, with individuals. The right contact can introduce you to the right person saving you the hassle of dealing with unnecessary underlings. With networking you leverage your time. Meeting and associating with the right group of people can also enhance an individual’s knowledge and experience, increasing the chances of a more successful career. This is often as important as the contacts. New skills and knowledge allows you to do more in less time as well. Following is a slightly adjusted Networking Guide For Business People that comes from some of my sales and personal marketing systems. It will give you the important basics of networking that can help you market yourself and your company more effectively at Conferences and Events. It is “who you are” from the inside-out that will determine the type of people who will be attracted to you as network companions. Today, most people will not endorse you just because you are a friend of a friend. They have to believe you are a person of reputable character and good intent and can deliver. Remember, you are on stage at all times, so don’t burn any bridges. Build bridges, build relationships and you will build your business. Most of us have been taught to be cautious of strangers. Someone who understands the power of networking sees every stranger as an opportunity. The opportunity could be someone you offer to buy a coffee for, open a door for etc. It could also be someone serving you at the event or even a salesperson attempting to sell you a product or service at the event. Be open. Treat all people with respect. Networking is not social climbing or seeing a dollar or rand sign stamped on everyone’s forehead. You and I can recognize people who are out to make it to the top by using other people … and we become cautious when around them. Be willing to assist others along with receiving. Sometimes the most valuable benefit we receive is personal and business development through the knowledge we gain. The key is to remember to always be respectful, courteous and give value in some way for leads and referrals that are given to you. We have all experienced someone phoning us to ask if we are busy on Tuesday evening and when we answer “no”, they ask us to do them a favour like mind their children for the evening. Often by approaching with a question we set up and unfairly leaves the other person very few options. We don’t usually do this intentionally. I suggest that we tell people upfront exactly why we are calling and then they can easily side step the request if they wish to. We are not out to trap people. It is also wise to let a contact know that if they feel uncomfortable, you would feel okay if they did not give you a lead, or introduction. A great personal example of an upfront statement would be; “Jack I’m not sure if you can help me or not. Please say no if it is not convenient at this time. Mary and Charlie were going to mind our children on Saturday night while we went to a wedding. Charlie’s mom passed away and they cannot do it. Is it possible for you to mind our children on Saturday night?” This way I’ve given Jack the full story so he can say “Yes” or “No” without getting trapped. Usually we ask…what are you doing on Saturday night? They answer “nothing.” We say “great can you mind our children?” They are trapped. At networking functions the prime goal is to “break the ice” and set up an appointment for further discussions and exploration. By attempting to sell yourself and your product while your new contact is trying to socialize could be perceived as insensitive, selfish and inconsiderate. The exception to this rule is when the other party literally asks you to do business here and now. That’s when the two of you move off to a quiet corner for a few minutes to complete the discussion. It is better to have a network contact introduce you personally to a prospective client than you phoning and saying Joe Smith gave me your name. A letter of introduction or a phone call in advance by your contact has more “clout” than the standard approach. Even a note on the back of the person’s business card or a quick sms from the contact who is introducing you can be effective. I have a friend who continually gets drinks and munchies for other people when at social functions. 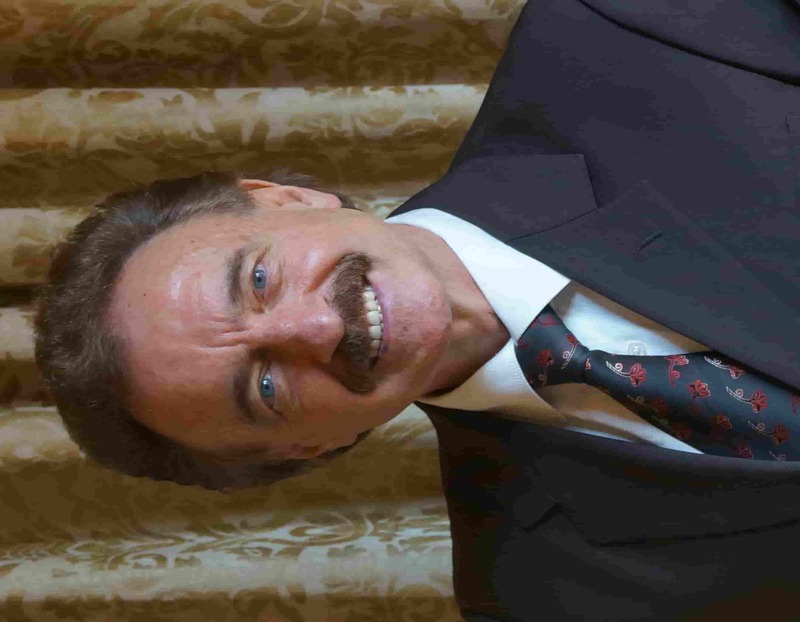 Many people get the impression he is the host even though he is a guest. This makes people more appreciative of “who you are”. Try it … it’s fun! Remember in new relationships others watch how you handle waiters, waitresses, parking attendants etc. Give your business card to new contacts at the beginning of a conversation so they have something to refer to for remembering your name and company. I would also suggest that you design a business card that folds and has your services on it. The business card is a sales tool. When leaving tips, or buying merchandise, leave your card so people know you and your company. When you receive a business card…accept it with both hands, look at it, make a compliment and then respectfully put it away. Also handle your business card with respect and care. Many businesses have missed out on tremendous opportunities because their friends, relatives, and associates did not know exactly what their career entailed and why the service or product provided is better than the competition. We have all heard of the elevator pitch. Barry Mitchell a top sales trainer in South Africa and good friend of mine has a great format. I married it with my 7 step approach and used the 5 steps. Make sure you have a good intro. I like intro better than “pitch.” Here is one I use following the 5 steps. See the template below and develop two of your own. Organize a system so that you immediately follow-up your contacts. Always carry a small notebook with you when at Networking functions or cards to write details on. You could use your tablet or smartphone also. Become a researcher and photocopy or scan useful information that your networking leads would appreciate receiving. Whenever you visit a potential client, take something useful to them. After an event most of us have far more leads than we can handle. Edit your names to establish priority leads and focus on those first. Break them into potential AAA, AA, A, B, C and even D (Detach). If your business can warrant it, pay a finder’s fee to sources that refer business to you. The money is a reflection of your thanks. The finder’s fee could be theatre tickets, airline tickets, a weekend for two in a hotel, etc. Be sure it fits the governance of that person’s organization. Hold your own VIP lunches and breakfasts or parties at specific times of the year. Invite the right people. Remember, once again, one of the main objectives of a “Be Seen” strategy is to build a data base of prospects and clients who have given you permission to contact them. This way you are not using Intrusive Advertising and Marketing…you are using Permission Based Marketing and Selling. If we really want to learn something the best way is to teach it to someone else. For the next 3 months have team members (one or two at a time) review a learning they received at an event. 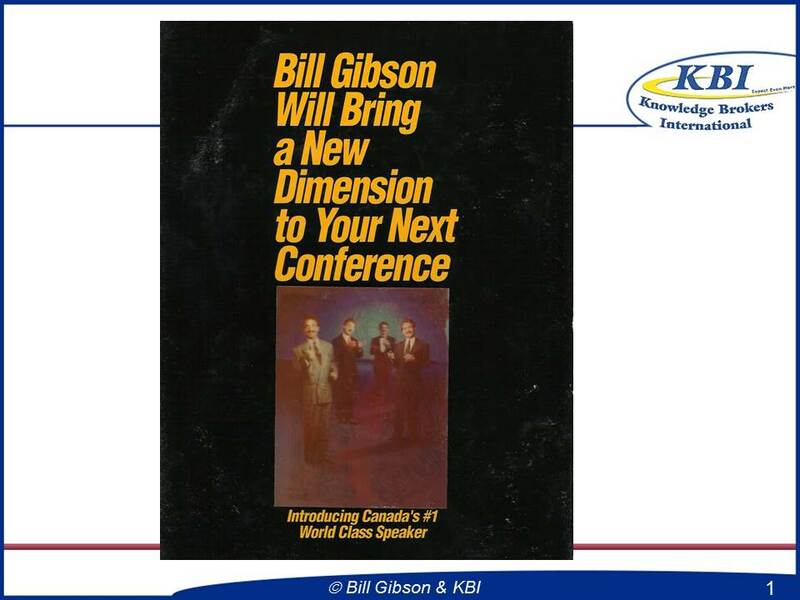 Purchase audio CD’s or DVD’s from the speakers and play sections of them at each meeting and discuss how to use the material, the benefits etc. Most of us have a tendency to procrastinate on moving forward with projects and ideas. It is often because we are not sure if this is the right time, if we have the “know how” and whether or not the way we have chosen is the correct way. Post this statement in several places where you can see it. It will definitely help you move forward. If Not This Way…Then Which Way? Think of the times you have not gone after something because you did not feel qualified and later you find out someone else less qualified than you got it. Don’t wait…Think…Start Now! You decide to exercise four days a week. The first few weeks you are right on schedule then one night you go out and over indulge with friends and don’t feel like exercising the next day. You drop your exercise that day and a day later you are exhausted from working and you skip another day. Inside of you a part says “I blew it, what is the use? I am off my schedule.” At that point many people give up on themselves. Here is the key. Just start again as if you had not even missed a day. Compliment yourself for starting again and just say you will do better this time. Most important of all is: Do not beat yourself up. Just get back in there and laugh it off. This type of scenario could happen when you decide to make a certain number of calls each day, decide to go to work early each day, etc. It is not easy to develop new habits overnight. None of us can control all the external circumstances that assail us. The only thing we can control is our reaction to those situations. So be ready for that part of you that may try and sabotage your actions by making you disappointed in yourself. Be kind to yourself and “laugh off” that part that tries to play the sabotage game. If you have to wait forever to see results it is easy to lose momentum. It is important to pick several “to do’s” that you can accomplish quickly or that show quick results. As you know, in selling, if you start off the day with a couple of small sales, it still feels great and you automatically pick up speed. Make sure you see quick results. Another way to keep things moving is to start off with projects or actions where you and others see the action visually. If the name of the company on the door of your car was an idea … do it immediately. You can see it … it means you have moved to action! A new suit, a unique business card, a personal marketing brochure or a powerful visual presentation can motivate you and others. You can see the action. If you are working on a three month project try and execute a visual action every couple of weeks. After an event put up reminders, posters, quotes etc. immediately. If people played sport and they did not keep score there would be very few players and virtually no fans. Everyone likes to know how well they are doing. Visual graphs, milestones, daily and weekly feedback on what has been accomplished, helps to fuel the fire of motivation. On long term projects the real result may not be seen until it is complete, but the motivation can lessen because of a lack of feeling of accomplishment. Set milestones and see them as “points of achievement.” This is a way of keeping score. It is also important to stop and celebrate how much you have achieved. The difference between a goal and a dream is a goal is a dream with a deadline. If possible seek out other people or companies that have accomplished or are experts at what you are trying to do. Study these people and if possible meet them personally. As you get to know them, you will realize that these people are ordinary people just like you. At that point you realize that if they can do it, then it is possible for you too. These people and companies become models of possibilities. An indirect mentor/model is someone who you do not know personally, but you study them through books, CD’s etc. A direct mentor/model is someone you invest time with and study and learn about. Remember the more you get to know mentors the more you realize they are not perfect. Don’t write them off. Celebrate, because if they can do it with their problems, it means it is possible for you too. This is different than a mentor/model. This is where you ask an associate, sales manager or a friend to act as a monitoring and support person. The role of this person is to see and hear what you plan to do, make suggestions, act as a sounding board and have regular meetings with you to monitor your progress and your motivation. 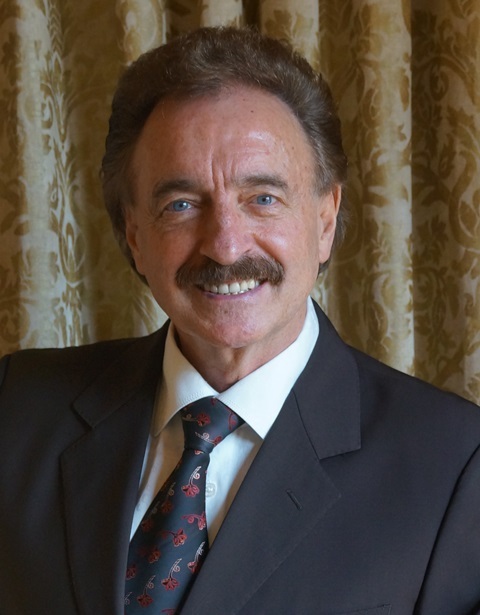 Listen to a complete set of audio CD’s on sales, motivation and/or personal development. Read an inspirational book that will improve you personally and in business. Watch DVD’s, YouTube Clips etc. that encourage self-improvement or improvement in business. This also includes viewing the CD’s and DVD’s from the event several times. Each time you will get a new meaning from the CD’s and DVD’s. Attend a luncheon/dinner/conference to listen to another inspiring speaker. Attend additional training programs that can add to and support what you are doing. Have you ever given a waiter or waitress a tip before they served you? Try it? You will be amazed how quickly they become motivated. The same principle can apply with you. There are things you may want to reward yourself with for the project or action you are going to take before you actually do it. That is like someone getting a new job and he or she goes out and buys a new outfit to help her perform better. It is a reward in advance of doing the actual work. Look for ways to reward yourself in advance. It is inspiring. I trust that you and your team members have had a quick “tune-up” and that you will now maximize your return on investment even more effectively…before, during and after Conferences and Events. 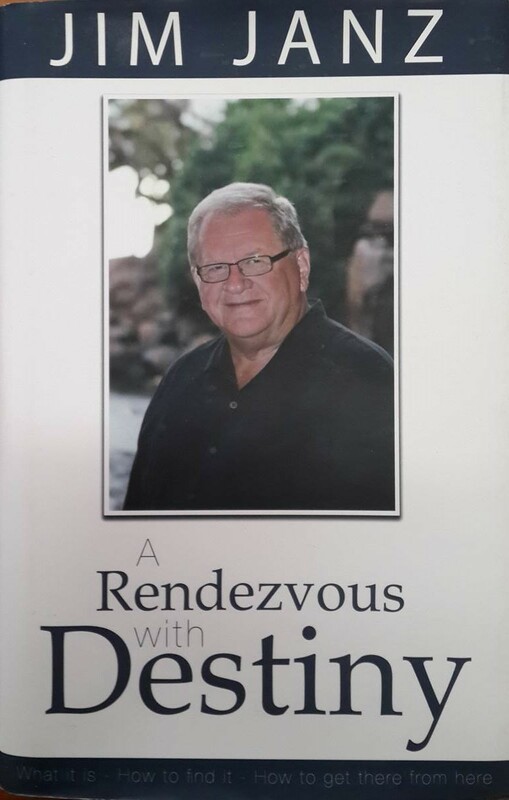 If you are a sales director, sales manager or executive who frequently runs meetings and would like a copy of my 24 Point Guide on “Putting Sizzle Into Your Meetings” please e-mail me at bill@kbitraining.com or phone us at +27-11-784-1720 in Johannesburg, South Africa. Otherwise…I will see you on the 29th of May in Johannesburg (Brian Tracy & Friends) or in Nigeria on the 6th of June. (The AYEEN 2015 Networking With The Giants Conference)…be sure to introduce yourself to me. Enjoy the great speakers…I will be “on stage” at both events. To make contact with the event organizers, to order more tickets or for general enquiries the AYEEN Team can be contacted in Nigeria at: 081-520-69933 / 081-282-43059 or Head Office +27-11-791-6390 (Johannesburg, South Africa). Their website details are: http://www.ayeen2015.org/ For the Brian Tracy & Friends Event in South Africa on May 29th you can contact the organizers at 0861 000 539. Their website details are: www.realsuccess.net / www.realsuccessclub.net. To view the T.V. commercial for me appearing in Lagos, Nigeria on June the 6th click this link: https://www.youtube.com/watch?v=o1C1IDkd5Ts. The scene: Two large round tables of business people at a Fund Raising Event for Dr. Robert Schuller’s (author of Possibility Thinking) Worldwide Television Ministry in Vancouver, British Columbia, Canada in 1986. I was 42 years old at the time. He was 60. The evening before I had the honour to be the Master of Ceremonies for The Dr. Robert Schuller Night in Vancouver (thanks to Jim Janz the organizer) with several thousand people attending…other speakers included Jimmy Patterson (self-made multi-millionaire and the honourable Grace McCarthy). It was one of the highlights and jumping off points of my speaking career. The man was a giant among evangelists and motivational speakers and I had the opportunity to get close to him. His response was; “there are times in our life we must just take control and become extremely self-disciplined.” The last words had just come out of his mouth when a waiter appeared from nowhere. He then teasingly put the most wonderful looking thick freshly baked piece of lemon meringue pie under his nose and then placed it on the table in front of Dr. Schuller and said “dessert for you, Dr. Schuller?” We all went silent as we waited for his response. His eyes lit up as he stared at the piece of lemon meringue pie and a big smile came over his face. Then he threw his head back and his arms out and in his big booming voice roared; “forgive me Jesus for what I am going to do!” There was a burst of laughter as he took his fork and cut off the front piece of the pie, put it in his mouth and slowly devoured it while making sounds of joy. Then without saying a word he reached over and picked up a salt shaker, removed the top and poured all the salt on top of the remaining 70% of the pie. That lesson has always stayed with me. We often say that we don’t have enough time to pursue our dreams? We could turn off the Television and set specific times for social media or go off social media for a week. We want to lose weight? We could only shop on the outside isles of the supermarket where the healthy food is found or throw out all the sugar and sweets in our homes. Sounds drastic, although I have never met anyone that has successfully overcome habits and addictions that are holding them back without making hard decisions and most of the time taking drastic measures to make the change. 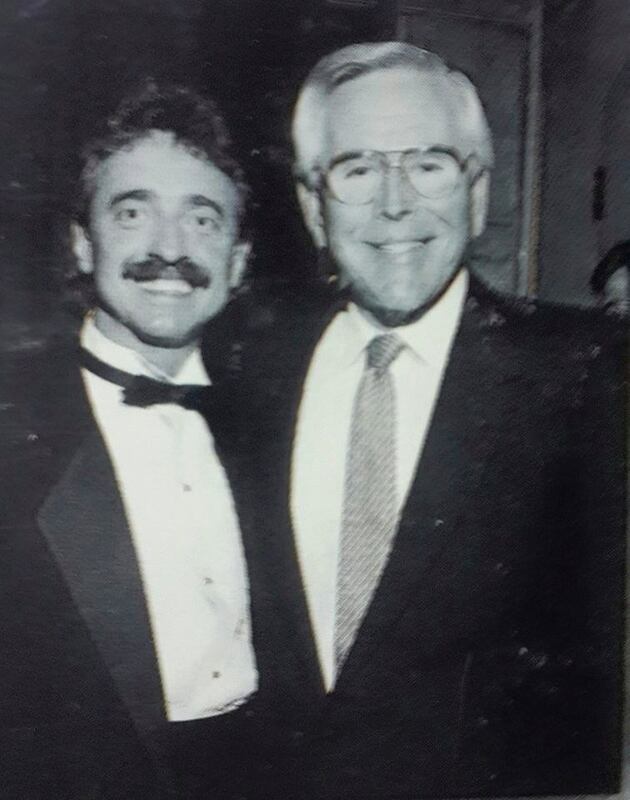 As Dr. Robert Schuller stated that day…sometimes we have to “do whatever it takes.” The photo is of Dr. Schuller and I at The Dr. Robert Schuller Night event in 1986 in Vancouver. Dr. Robert Schuller passed away this past Thursday, April 2, 2015, at the age of 88. He was the heart and energy behind the building of the magnificent Crystal Cathedral in California. 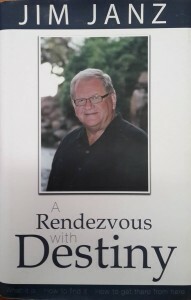 For years millions of people in countries around the world were inspired and uplifted every Sunday morning by him through his Television Ministry. This is my blog tribute to Dr. Robert Schuller and his family. I am sure he is still wearing that beautiful robe. Only now it is white and radiating “white light” that is still touching the hearts of many souls here on earth and beyond. Thank you Dr. Schuller for being such an inspiration to us all. May you rest in peace. Through my own personal development and spiritual practises I sometimes have insights that surface for me and I put them in writing. Some of you may find the following insights useful at this time in your life. For me, I find the more years I am on this planet, the more I understand that the real power comes from within. The Personal Development & Spiritual Life section of my Blog is placed on my Blog with only the good intent to support and serve the core beliefs and values of all people, regardless of race, creed or religion. This insight I am sharing with you is not meant to challenge, convince or spark a debate. The force that is present in most of our lives has many names. Some of them are Allah, Shiva, Krishna, God, El Shaddai, Great Spirit, The Infinite, The Divine, and the list goes on. The language I often utilise is God, the Divine and the Infinite. Make Reality Your Friend – Overcome Denial: It is important to know where you are at in order to get to where you want to go…face reality…believe it! If you are behind budget, have a big client cancel etc…don’t say “I can’t believe this.” Believe it…be honest about your situation and start there. Make reality your friend…don’t deny it. A captain of a ship was once asked what information he needed to reach a specific destination. His answer was “firstly I need to know the name of the destination for example, London, England…but just as important I need to know where I am at on the ocean before I start. That way I can plot my way to London.” Face Reality…start where you are really at. Break Your Targets Or Goals Into Smaller Chunks: Decide on your targeted numbers or activities and then break it down into weeks and then into daily targets. Check your results twice daily “What Gets Measured Gets Managed And What Gets Managed Gets Done.” When you mark off a “To Do” what happens is you get a feeling of achievement, that achievement creates energy and the energy in turn creates spirit. Great way to boost your spirit. Plan Or Review Your Day The Night Before: Plan your daily activities the night before and let your subconscious work on it while you sleep. That will start your day with momentum. Momentum is one of the keys to success. Early Morning Appointments: Having 7:00am breakfast or coffee appointments one or two days a week ensures a fast start (Momentum) and done weekly could produce miracles. You very seldom cancel a meeting. It is a great way to help with self-discipline. Book Two Weeks In Advance : For next week 70% of your appointments booked out by Thursday afternoon of this week and 30% booked for the following week (pro – active time). You will have a good weekend and have momentum early in the week. Last Call Or One Last Task Of The Day: Just when you are about to “call it quits” for the day make one last phone call or personal visit or last task. It can turn a slow day into a great day. If You Are Hot Don’t Stop: When you are on a “roll” don’t stop! Capitalize on the momentum. Momentum seems to bring lucky breaks. “Ask for the business even at the risk of getting it.” Always be asking for the business…give us a try? What else can we do for you? What do you see you may need help with in the future? Target With Frequency: Increase the frequency and quality of contact with our best clients and our competitors’ best clients. 80% of the business will come from 20% of your clients. Utilise Credible Endorsements: What others say about you, your product, service or company is much more credible than what you or I say about ourselves and our products etc. This year utilize credible endorsements as often as possible. An example of that is a posting we just posted on LinkedIn and Facebook. 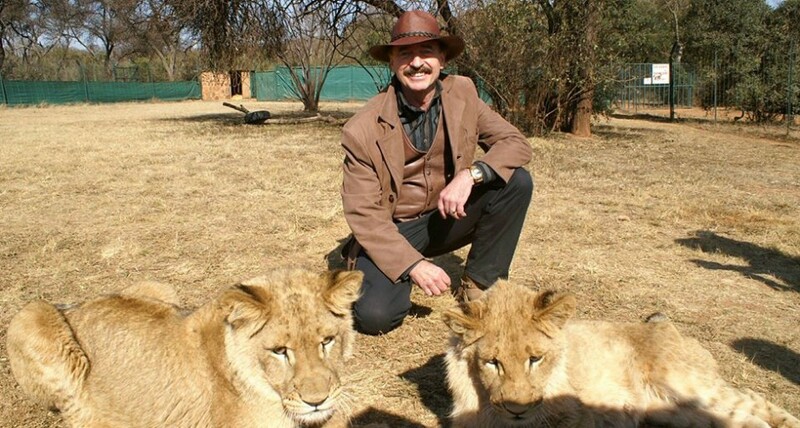 It’s for a FREE Webinar I am conducting on Tuesday, January 20th, 2015 from South Africa. The posting is posted below. 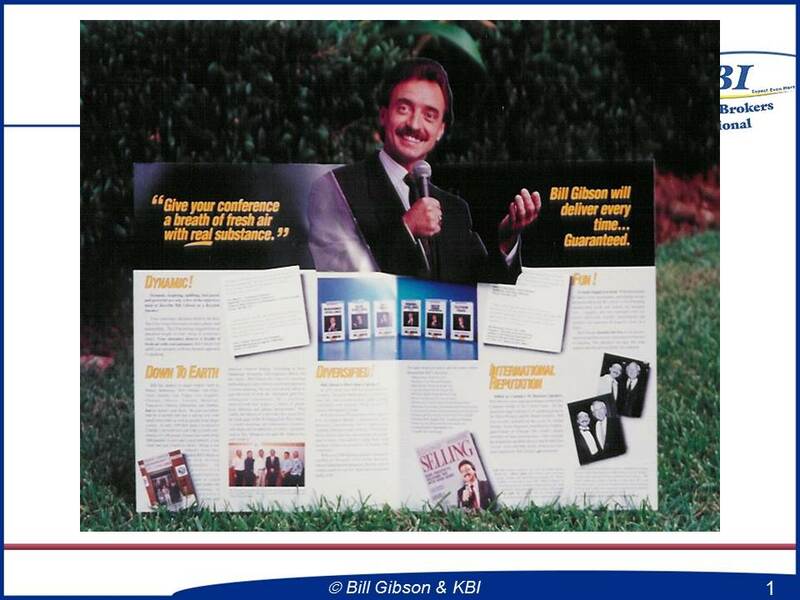 This is what this world renowned author/speaker/teacher says about Bill Gibson’s Sales & Marketing Material. Please feel free to register for this FREE Webinar if it is of interest to you. It would be great to connect. All the best with your Fast Start For 2015. In February I will also be conducting 2 Day Intensive Workshops on Making “Real” Marketing and Selling “Really Pay.” The workshops will be held in Durban, Cape Town and Johannesburg. For more information go to the following link: http://www.entrepreneur.co.za/how-to-make-real-marketing-really-pay-2-day-event/ or contact our office directly. Our office contact details are below. Research shows that only 4% of the population actually have written goals and the 4% who have written goals achieve them 95% of the time. Believe it or not…goals can be so powerful they can actually help people delay dying by a brief period. In China one group surveyed death patterns. They discovered that just before the Chinese Moon Festival there was a 35% drop in deaths and that immediately after there was a 34% increase in deaths. People briefly delayed dying until the festival was over. In another survey with a specific religious sector of elderly people they discovered a 34% drop in deaths 1 week before a major annual religious holiday period and a 35% increase in deaths immediately after…the amazing power of goals. Most people don’t have goals. They have wishful thinking. What is missing with wishful thinking is clarity of purpose, actions and time lines that get them there. Goal setting is one of the most important habits and abilities that a business owner can have. According to Dr Lee Pulos, having a focus on a self-determined destiny or goal, is the one quality consistently found in people who are high achievers. With goal setting it is important to make sure that your goals are achievable goals. If they are sales targets they should be achievable sales targets. Goals need to be attainable and realistic. One of the common reasons for depression is continually having goals that are unfulfilled. According to Dr Lee Burke, children who grow up to be happy children are continually given goals by their parents, but they are achievable ones. Achievable goals create happier people. So, keep setting new but attainable goals and maybe some day you will laugh as often as a child. A child laughs on an average of 400 times a day, the average adult laughs 15 times a day. Let’s look at how I can help you set and achieve your coming year’s goals so that you not only become a more prosperous business owner, salesperson or executive but also an even happier person. To make it quick and simple for you I have simplified the process with 5 Steps. The first key to success in any area of your life is to know what you want with no indecisiveness whatsoever. Once you really know what you want you have clarity of intent. The clearer your intent is, the greater the emotional desire is to obtain what it is that you want and the sooner you will experience it becoming a reality. Build a 6 month Cash Reserve for the business by December of next year. With any potential goal, ask yourself the question…do I have the time, energy, ability and desire to commit to this. Start only those you want to achieve and the ones you know you will persevere forward with and enjoy the journey moment by moment because you probably will experience the long dry desert called The Dip before reaching your goal. Ask yourself, “in my heart do I really want this? Is this my goal or is it someone else’s goal and I think it is mine?” Be sure it is your goal! For clarity your goals must be Smart Goals. You also want to make sure your goals align with your personal values and personal beliefs. If the goals do not align you will continually sabotage your progress. As an example of a goal let’s assume your specific goal is to hit 3 million in turnover this year. Now that you have chosen a goal we go to Step 2. There is the old saying, “How Do You Eat An Elephant?” The answer “One Bite At A Time”. To achieve any goal you must break the goal down into smaller digestible bites or into smaller chunks or more narrow time frames. For Example: you now break your 3 million goal down into sub goals. You then do the same for the second, third and fourth quarters. By breaking the big goal down into smaller chunks, you began to see how it is possible and reasonable to attain the goal. At this point you put together an action plan broken down into monthly, weekly and daily activities to achieve the smaller goals that will eventually lead you to achieving the overall goal. To simplify an explanation of an action plan, we will utilise the previous example. Let’s say your average sale is 5,000 and you have three sales people. In month one your team needs to see 150 clients to close 30 sales at 5,000 per sale. In January they only have 15 working days. You decide you need two of your salespeople to see 3 clients per day and one salesperson has to see 4 clients per day. This will give you your 30 sales for the month of January. The key here is you have your team moving to action daily with specific activities. “What gets measured, gets managed, and what gets managed, gets done.” You need to have a system that measures your progress. In other words “Keep Score” so you can pat yourself and your team on the back for how far you have come. You can also see whether or not you are ahead or behind in the activities needed to reach your goal. By having measurements you receive a feeling of achievement when you accomplish the task or are ahead of schedule. It gives you short time measurement targets to reach for. You can also see if you are lagging behind. That awareness can then stimulate you to increase your actions, adjust them or change them. Measurements in the example would be measuring the activities, the number of sales and the average sale size. Put up a “results and measurement board” so the team can see it. Track it by the day. Have celebrations and rewards along the way to reward yourself and your people for a job well done. Add these additional tips and you are well on your way to achieving your goals for the coming year. Be clear about your motivation. Make a list of why you want to achieve the goal. The why is what really motivates? Interview people who have achieved a similar goal and gather stories and articles about how different people have done it. You need “models of possibility” directly (face to face) and indirectly (stories and articles). Draw a picture or create a collage of photographs of what your goal is, or “how you will feel” or “what you may receive” when you reach your goal. Make up a screen saver with your goal on it. Develop some self-talk statements or affirmations that support your goal. Set up some type of measurement system and have rewards at certain points of accomplishment. Make them visible, carry them with you and review them regularly. May you have health, wealth and happiness in the coming year! In February I will be conducting 2 Day Intensive Workshops on Making “Real” Marketing and Selling “Really Pay.” The workshops will be held in Durban, Cape Town and Johannesburg. For more information go to the following link: http://www.entrepreneur.co.za/how-to-make-real-marketing-really-pay-2-day-event/ or contact our office directly. Our office contact details are below. Also, if you have found this blog article to be valuable for you, I would be grateful if you “shared” it with your Social Media Networks. Also feel free to circulate it by e-mail or other means internally within your organization or externally to your clients, suppliers and personal and business network. Two weeks ago I travelled to Durban, Cape Town and Johannesburg, South Africa with entrepreneur.co.za speaking on the Real Success Tour. My topic was “Real” Marketing From The Inside Out. 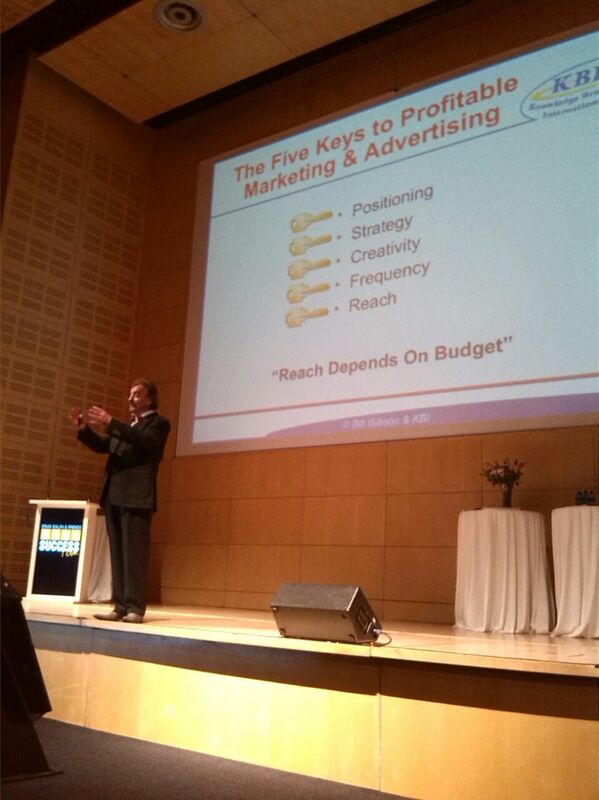 Part of my speech was focused on The Five Keys To Profitable Marketing & Advertising. We have had several requests from attendees to write a blog on the subject and expand on what I shared with the 3 groups. To simplify, there are five key elements of marketing (1) Positioning, (2) Strategy, (3) Creativity, (4) Frequency, and (5) Reach. Most people misunderstand the first three basic concepts and often make the mistake of buying into or putting the creativity first and then trying to set up their strategy and positioning. This is usually not the best sequence. When you are talking about developing the sales, marketing, advertising and promotion side of your business, you have to determine your positioning first. What do I mean by positioning? Well, I’m sure that you have walked into a clothing store and left within a few minutes because you decided that it was not the place for you. That store was not geared to your type of personality, your economic situation, and so on. It was not positioned for you. Or you may walk into a restaurant and within a few minutes feel uncomfortable. However, that restaurant may be packed with people who are happy to be there because it feels comfortable to them. It has obviously positioned itself to attract a specific group of people and make them feel good. The restaurant would not be successful if it had you as a target customer with its present atmosphere. Determine how you should position your business. The key questions to ask yourself are (1) Who are you positioning your business for? and (2) How do you position yourself to attract them? How do you position yourself to attract your target market? First, be sure your business location fits your target market. I know of a beautiful seafood restaurant that opened just one block too far down the street. The owner was from another city and assumed that the location was okay. The block he was on had, prostitutes at night. He was used to that in the big city, but the conservative residents of this smaller town were not. They stayed away, and he went out of business. It is also important to make sure that the advertising fits the people and that your services are appealing to them. The training of your staff, the sales approach you take, the character of your building, the inside of your office or store, the promotional and advertising materials you use, the places you frequent, the traditional media and social media you use and the prospects, clients and customers you target will “roll out” from your positioning. Once you have determined your positioning, lay out your strategy. What are you going to do to reach and attract these people? Strategy is important. Through strategy many businesses have grabbed major market share and over time have become number one. Strategy is often what makes the difference. When determining a strategy, you must understand your competitors, the market and especially your niche market. Then you must decide whether you’re going to do defensive marketing, offensive marketing, blanket marketing or commando marketing. Your size, ability, flexibility, and the amount of market you are dominating will determine which of these four basic marketing strategies you should use. Commando marketing may be used if you are a small business or if you are a large company moving into a market that is strongly held by competitors. With this strategy you use innovative promotional ideas that are delivered literally in person. It could be that you and your team inundate a conference: take a suite, fly in 500 lobsters, and put on an excellent reception for clients. At the suite, your clients meet your technical and service people along with the marketing people. They all leave with a personalized gift and a piece of advertising in hand. Later you follow up with a phone call. This advertising is not public. It is more personal. You may not be able to go head to head with the competition, but you try to get a good toehold in the market before your competitors realize you are a threat. Attack marketing is used if your business is a good size and is strong and innovative. You may be the attacker or the aggressor that keeps the big competitors on the defensive. Using attack advertising and marketing, you decide on specific areas or times to try to dominate the market. Blanket marketing is used to cover the entire market. It requires a large advertising and marketing budget. If it is the best time of year for marketing, and if a good return on investment is possible, you may hit every conceivable medium that reaches your potential customers. Defensive marketing allows a large company that dominates its market or even a small company who dominates a niche market to defend its customer base. Knowledge and tracking of the competition is important when you are in this position. Sometimes your best defense is a good offense, especially if the attacker is showing signs of disorganization or weakness. Often a company may use a combination of these four marketing strategies. Large companies that are spread out over great distances usually have different branches at different stages of success. Some branches may be using commando marketing; the more established branches may use defensive marketing. After you decide which marketing strategy suits you, determine whether the advertising and marketing is going to be social media, television, radio, direct mail, SMS, e-mail, billboard, newspaper, magazine, or a combination of these and other media. Once you know the positioning, you will know what radio stations your customers listen to, what television shows they watch, what newspapers and other publications they read, what lists to buy what social media posts to boost, where they drive, what streets they live on, and what billboards are in their area. (There are statistics from ad agencies and media reps that can give you this up-to-date information.) Track the results of your marketing, and don’t be afraid to make a change. Of course, you have to keep in mind how much money you have. Say you are aiming at thirty- to thirty-five-year-old males with above average income and you only have R25 000 to launch your product. You may do a survey in an upscale shopping center for that target group. You look for men between thirty and thirty-five years old and ask them to participate in the survey. The questions would focus around hobbies: what sports they play, what radio station they listen to, what clubs they belong to, what kinds of cars they drive, what magazines they read, where they shop, and so on. You use this information to select the specific ways to reach them. With R25 000 you may decide to cosponsor an event with a major clothier, a health club, or a magazine. In my opinion, the most effective element in selling, marketing and advertising is frequency. If you reach 10 000 of the right people ten times rather than 100 000 people once, your advertising rands will be much more productive. To obtain more frequency, run several commercials on the same television program or the same radio time block, on the same radio newscast every morning, or run several ads in the same newspaper on the same day. The key to obtaining value from frequency is to increase impact by reaching the same consumer several times. In sales it is better to reach 50 of the right people 10 times with the right methods than 500 people once. A one-time pizza commercial on a late night movie will have to be a great mouth-watering event to motivate a consumer to purchase. The same commercial run several times during the show can dramatically increase response. Even though you may reach a small number of people, if they are the right people and you reach them enough times with the right message to make them respond, and it is affordable, you have effective advertising. One of my clients, Terry Straker, and I really blew the minds of the media reps in Calgary by buying two or three commercials for Terry’s company during one half-hour TV show. TV station personnel told us we’d still get the frequency we wanted by spreading the commercials out between programs that eighteen- to twenty-four-year-old males watch. But who was to guarantee that the same viewers watched all three programs? By placing the commercial in the specific TV show three times in half an hour, there was a much better chance to reach viewers two or three times and move them to action. Reach is the total number of different people or companies you reach. In most cases, the media advertising mediums would rather see you spread your advertising out. It gives them a chance to sell more clients into specific “air time” programs. For example in Radio and TV a lot of their commercial packages are spread across time slots so that they can move their inventory more evenly. If you really spread out, you’ll reach more people fewer times. There are times when you may want to do this. Maybe you are creating an awareness of a product or service just to back up a sales team. At a time like this, a widespread reach could be more important than frequency. The tighter you pull the scope of your advertising in, the fewer people you will reach – but you will reach them more times. Your reach depends on the budget. Go for frequency first, and then spread out to reach more people if you have the money to spend. Reach depends on the budget you have. This includes use of Facebook, LinkedIn, Twitter, etc. as well. One way to build frequency is to repeat a specific point several times within a thirty-or sixty-second commercial or social media adverts or in a print ad or billboard. If a specific point hits you three times in a commercial, social media advert or social media ad and you hear or see the ad three times, that means you got that point nine times. Too many people try to do so many different things in their ads that they lose the impact of a specific message. Again, remember, Frequency first and then Reach and Reach depends on your budget. Good luck!